Syracuse Abroad is offering $1,000 competitive merit-based scholarships to Syracuse University undergraduate students who apply to a summer 2019 study abroad program. Students are encouraged to take advantage of summer study abroad and this new funding source to experience what many other students have already discovered about the significance of learning and living abroad, Syracuse Abroad administrators say. 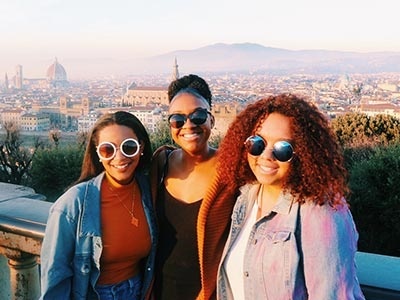 Undergraduates must apply for the summer program scholarships by completing an application for a Syracuse Abroad Summer Program through the Orange Abroad web portal by Sunday, Feb. 10. A limited number of the competitive scholarships will be awarded based on academic records and on the review of a personal essay or a personal statement video. With funding from the University’s $100 million Invest Syracuse initiative, the new Syracuse Abroad Summer Program Merit Scholarship was created to help expand opportunities for students to participate in any of the academic summer abroad programs in Africa, Asia, Europe and the Middle East. Wilkens notes that summer programs offer a chance to study abroad for all students, especially those who may not be able to study abroad for a whole semester. “This is particularly true for students with heavy course loads, specific sequence course requirements, athletes and others who may have never thought about a program abroad before,” she says. The varied summer abroad programs include “Revolutions, War, and the Prospect for Democracy in the Middle East in Dubai, United Arab Emirates”; “Arts of Spain: Paintings, Architectures, Cities in Madrid, Spain”; “Paris Noir: Literature, Art and Contemporary Life in Diaspora in Paris, France”; “Three Cities Architecture Studio in Asia”; “Experiencing Education in Rural and Urban Settings in Kenya”; and summer sessions in Madrid, Florence, London and Strasbourg, along with several internship programs in the various regions. These and the many other programs can be accessed at this website. The instructions and the place to upload the essay or video essay are within the application on the Orange Abroad portal at syr-sa.terradotta.com. A selection committee will review all applicants after the deadline of Sunday, Feb. 10. For additional information, contact Marie Kulikowsky, Syracuse Abroad assistant director of summer sessions and faculty-led programs, at 315.443.9419 or mkulikow@syr.edu. Syracuse University is a private, international research university with distinctive academics, diversely unique offerings and an undeniable spirit. Located in the geographic heart of New York state, with a global footprint and nearly 150 years of history, Syracuse University offers a quintessential college experience, as well as innovative online learning environments. The scope of Syracuse University is a testament to its strengths. At Syracuse University, we offer a choice of more than 200 majors and 100 minors offered through 13 schools and colleges and 18 online degree programs. We have more than 15,000 undergraduates and 7,500 graduate students, more than a quarter of a million alumni in 160 countries and a student population from all 50 U.S. states and 123 countries. For more information, visit syracuse.edu.